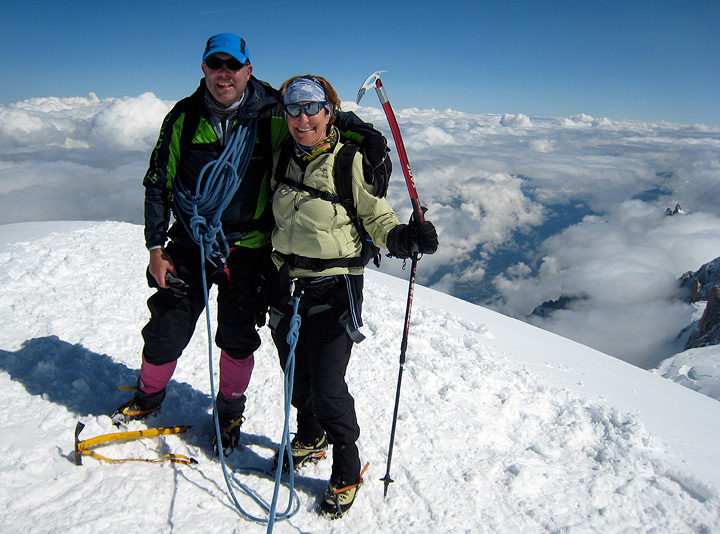 Marcus Gallie and Elizabeth Moceri, normally among the ski crowd but also mountaineers whenever the chance arises, were in the Chamonix Valley to, among other things, climb Mont Blanc! They also saw to their NEW APARTMENT PROPERTY! 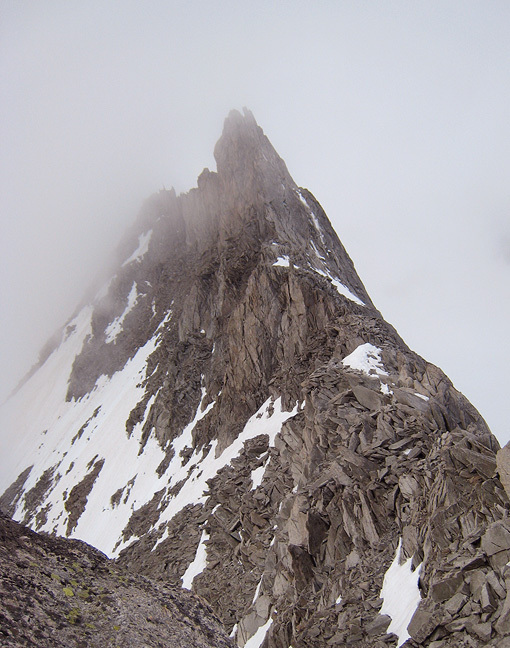 and Marcus mountain biked himself half to death on the Tour du Mont Blanc. Around it, then up it! Nothing by halves. Thunder storms were on the menu for the first couple of days. Here we emerge from the first downpour, as blue skies return. 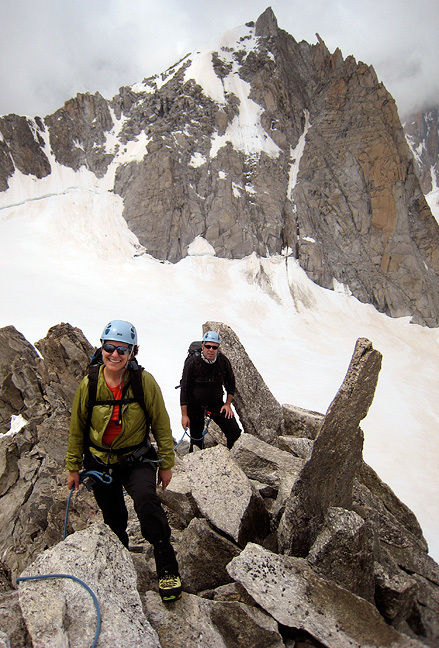 Our acclimatization program had us climbing the Aiguille d'Entreves on our first day. 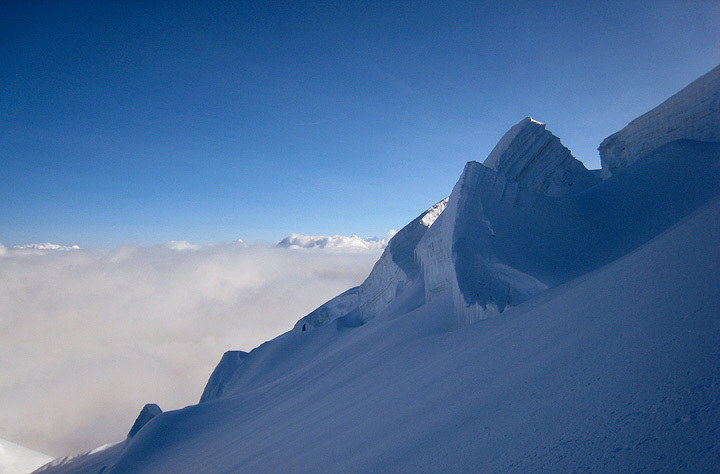 The summit disappears in mists as we look back after our climb. During the climb we were in and out of the clouds. 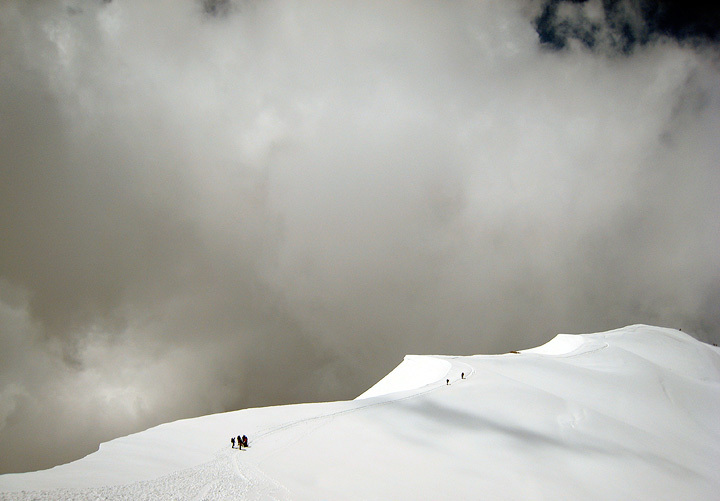 We did have blue skies as we summited. 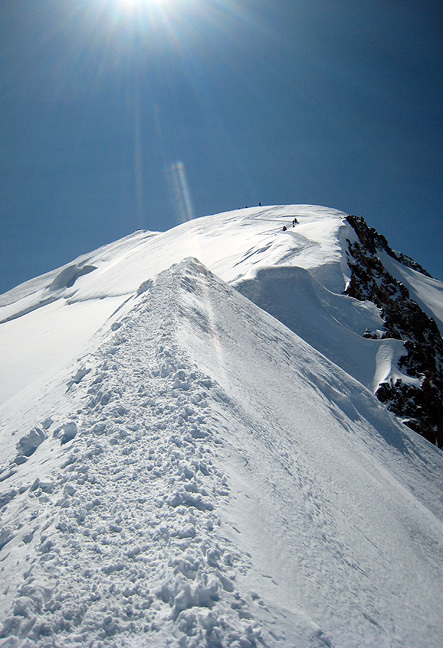 Looking back up at the summit as an Italian climber begins his descent. The Tour Ronde in the background as the thunderstorms approach. 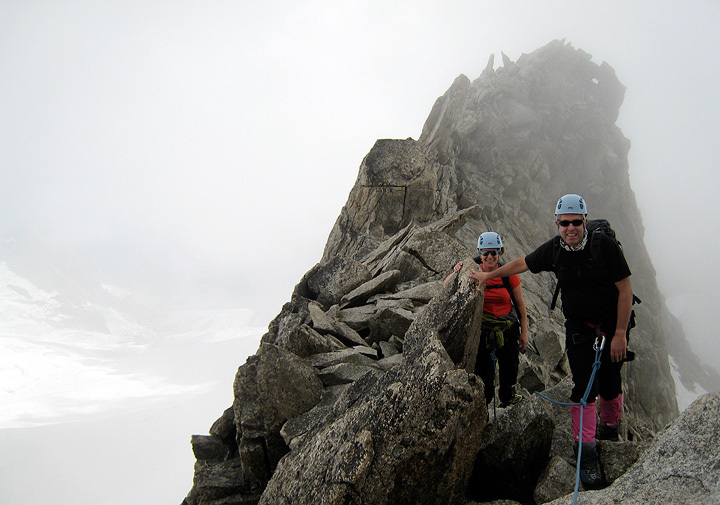 On our next day we headed up to the Tête Rousse hut. 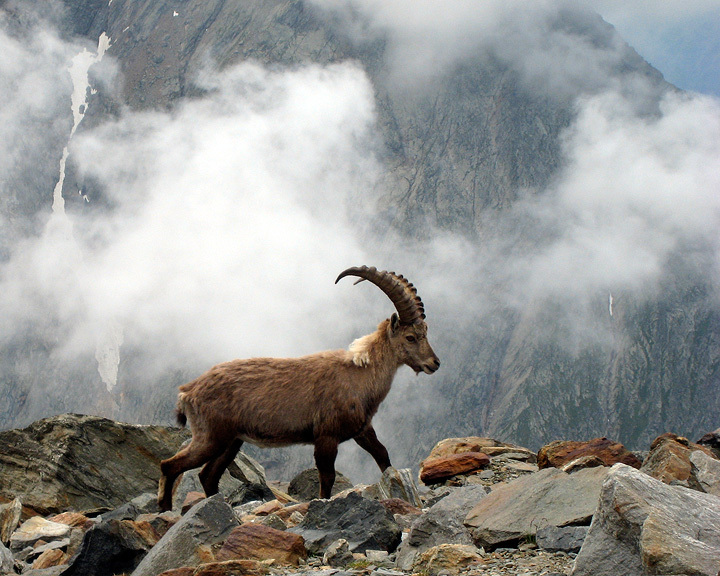 On the way, extended families of ibex didn't mind the human visitors at all. 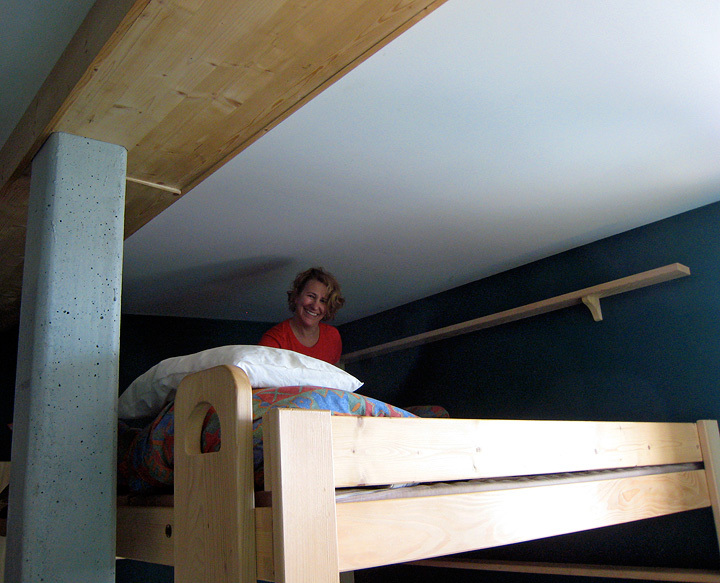 Settling in for a nap in the comfy Tête Rousse hut before our 1 am start. 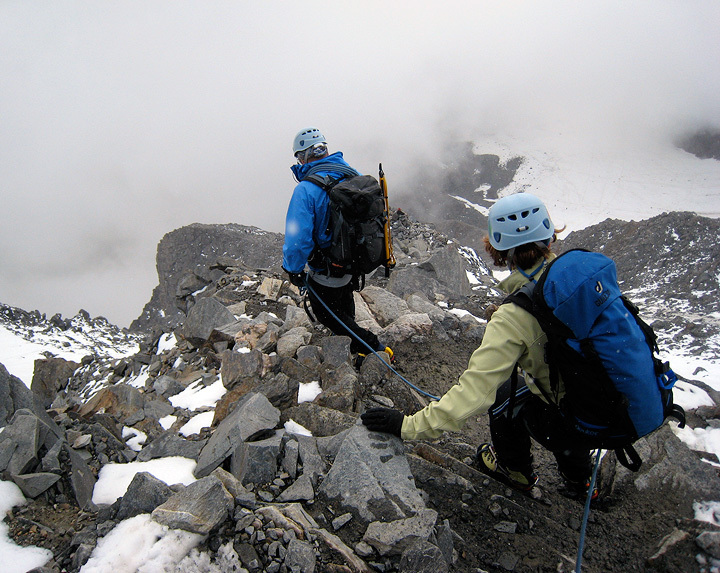 Up and out extremely early, we were climbing the rock ridge below the Gouter hut in a snowstorm. 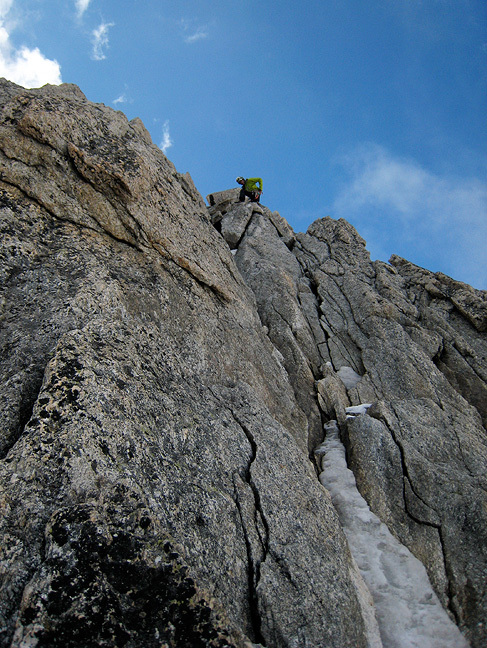 It had snowed heavily in the late evening as well, so conditions were rather special for July. 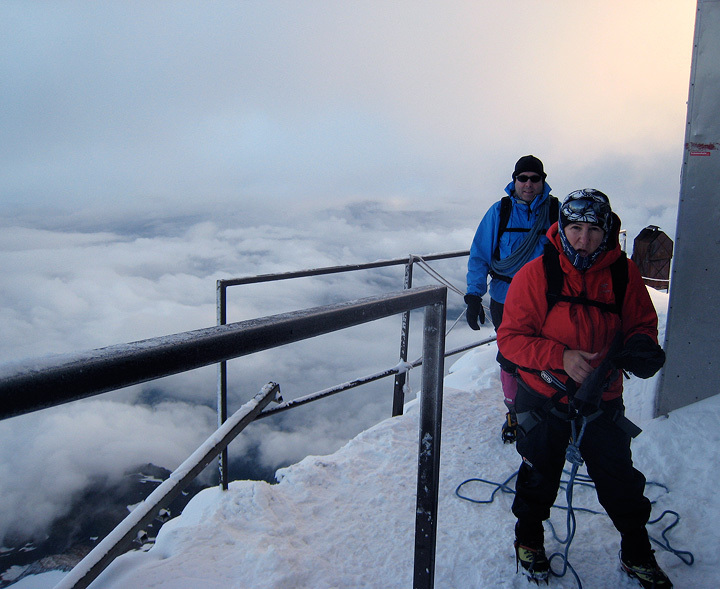 We got to the Gouter hut at first light, had a snack and carried on, glad to have missed the hurly-burly there. 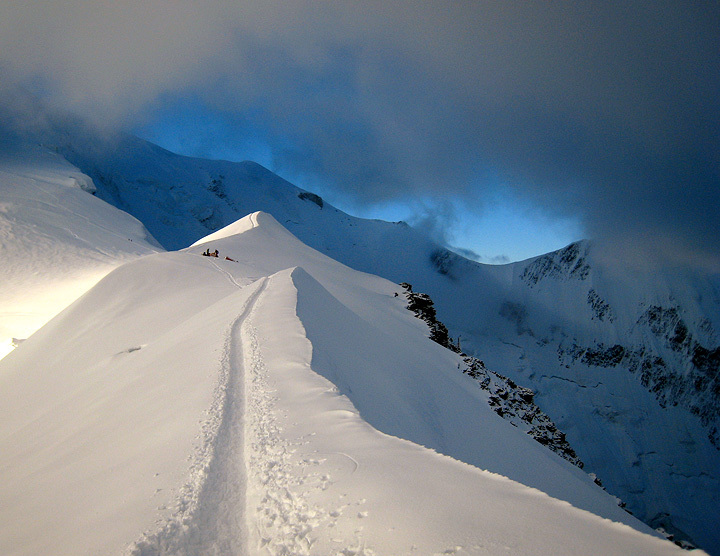 Leaving the hut, we passed by the usual encampment on the Arête du Gouter at dawn. Looking upslope from the last picture, things look promising for improving weather. 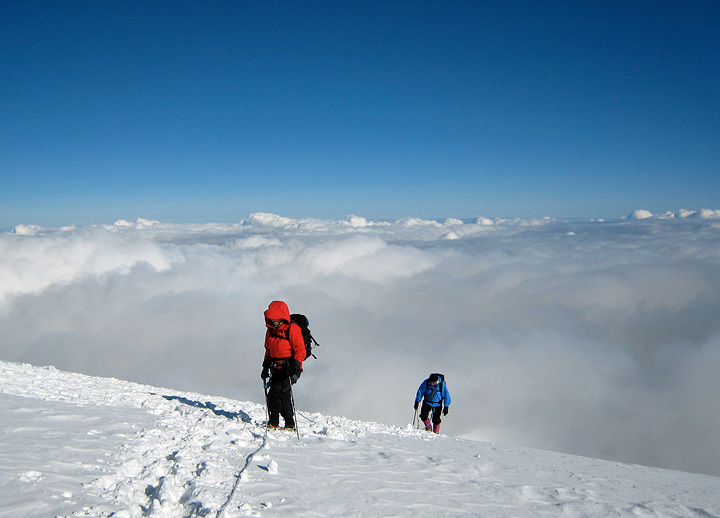 Sure enough, by the time we neared the top of the Dome du Gouter, we were definitely climbing up above the clouds. The sea of cloud stayed more or less stationary all day. The folks in town had no idea it was a bluebird morning above 4100 meters! 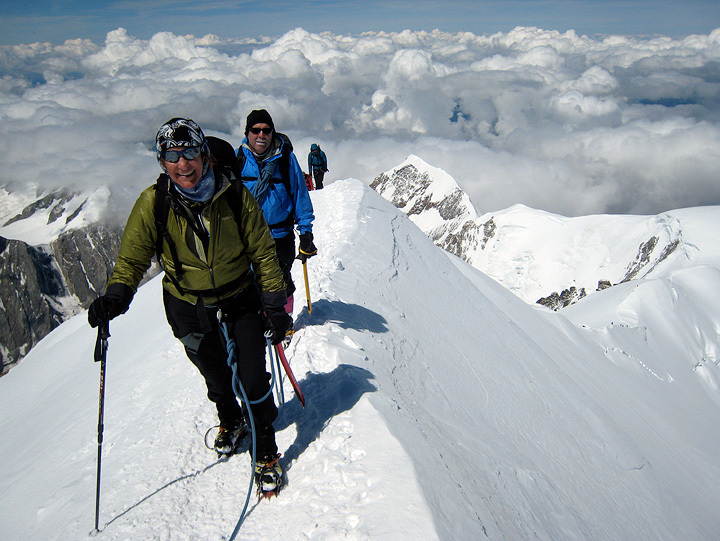 On the ridge above the Vallot hut, conditions are nearly perfect. 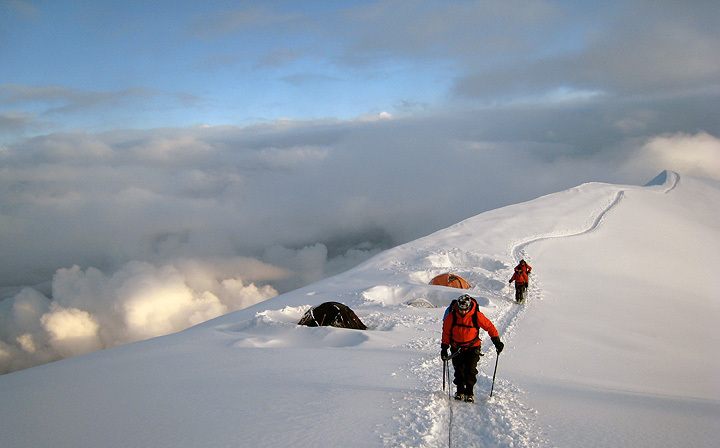 Our energy surges as we near the summit. Almost there now! On top at last! 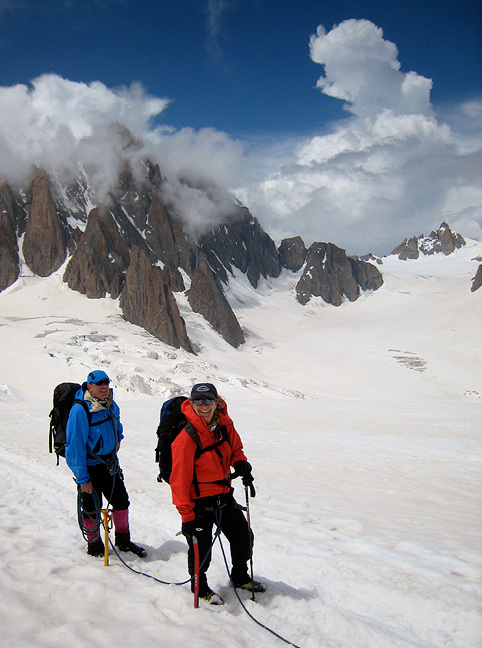 Having started at 3176m and gained more than 1600 meters, we were definitely ready for "second breakfast"! 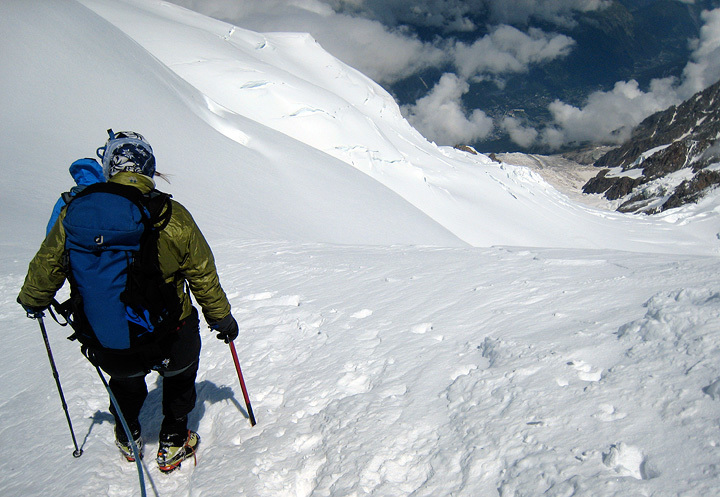 But of course we still have even farther to descend. Stepping carefully with the big plunge to Chamonix below (visible through a hole in the clouds), we start down. Approaching the Gouter hut once more, we are nearing the cloud zone again. Late departures pass us as we descend. 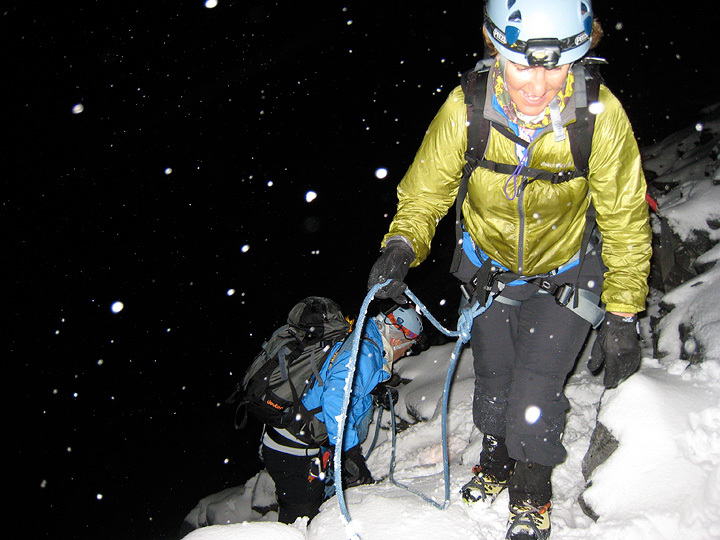 And once again it's snowing as we descend the ridge below the hut. It's a lot easier when you can see where you're going! 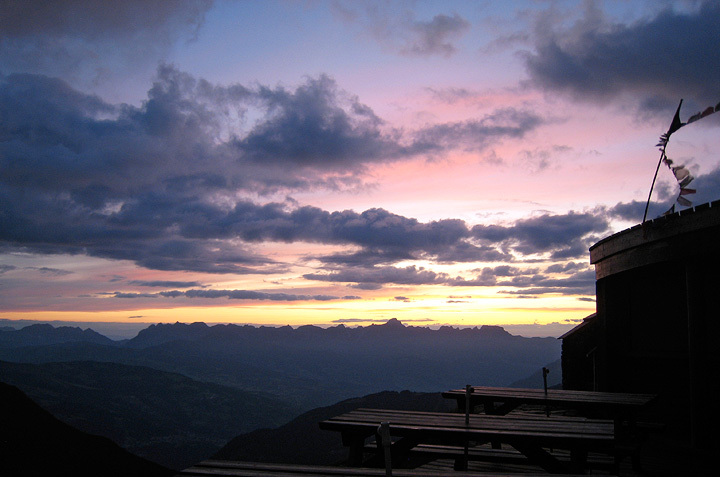 We arrived at the Nid d'Aigle refuge, footsore and weary but in time for dinner, a gorgeous sunset, and a deep sleep in a quiet bed. Mmmmmm, nighty-night!